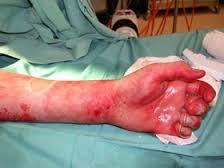 A burn is a type of injury to skin, or other tissues associated with burning sensation. Cells die partially or completely depend upon the severity of burn. 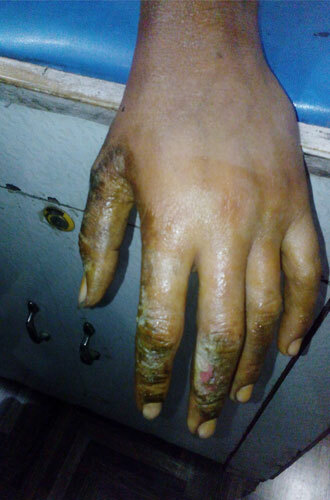 Burns are categorized by severity of burn surface & its depth. 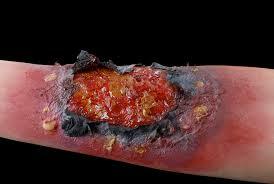 The most common complications of burns involve infection, Blood Loss, hypothermia, keloids and shock. 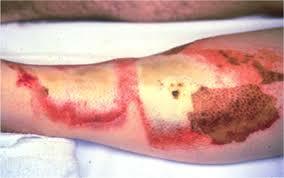 All kind of burns carry the risk of infections because bacteria can enter broken skin. 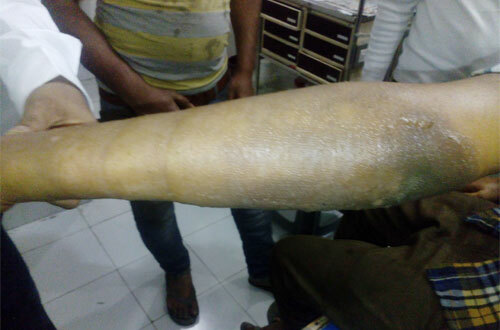 The long-term outcome is primarily related to the size of burn and the age of the person affected. Do Not apply self-medications or any household remedy to a severe burn. At temperatures greater than 44 °C (111 °F), proteins begin losing their three-dimensional shape and start breaking down. This results in cell and tissue damage. Disruption of cell membranes causes cells to lose potassium to the spaces outside the cell and to take up water and sodium. The size of a burn is measured as a percentage of total body surface area (TBSA) affected by partial thickness or full thickness burns. 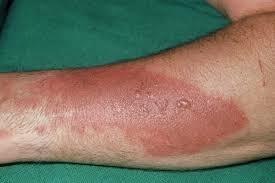 First-degree burns that are only red in color and are not blistering are not included in this estimation. 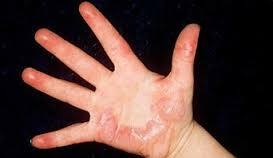 Most burns (75%) involve less than 12% of the TBSA. The prognosis is worse in those with larger burns, those who are older, and those who are females. The presence of a smoke inhalation injury, other significant injuries such as long bone fractures, and serious co-morbidities (e.g. heart disease, diabetes, psychiatric illness, and suicidal intent) also influence prognosis. 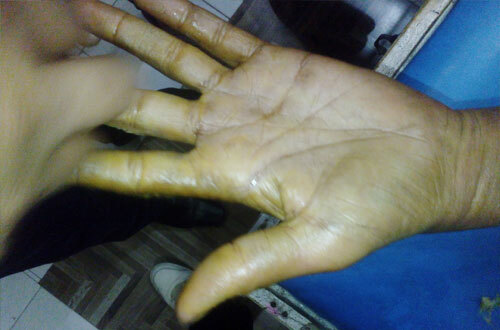 Mokshak Ayurveda’s Burn Treatment is most reliable and applications have excellent result. 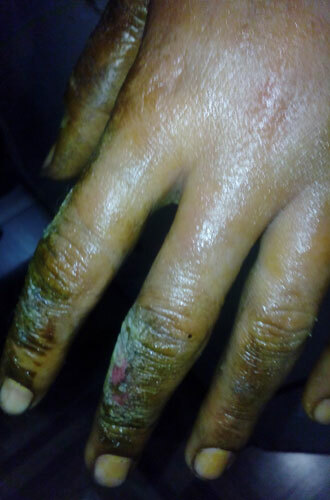 We use burn care bandage which is a composite of 100% herbal oils and blend of precious herbals. 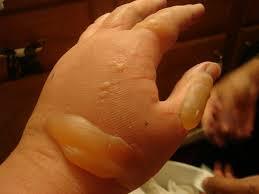 Mokshak’s Herbal Ointment Bandages (Burn Care) are most effective in burn cases. We observed in many of cases that results found within few days without any kind of burn blur. There are no adverse effects during the herbal treatment. Mokshak Ayurveda or Herbal Treatments success ratio is higher than other treatments in terms of cost, time, convenience & long-lasting effects. We have seen most cases in our clinical practices, burn applications given by Mokshak Ayurveda, instantly stops the progression of skin’s blistering as well there are no burn mark on skin. Skin Redness, Waxy & White, Charred, Dark Brown, Leathery type turn out to be natural skin after few herbal ointment bandages. These bandages (Burn Care) prevent to spread the infection and other common complications such as blood / plasma loss, hypothermia, keloids, edema, pain, disconfortness. Mokshak Ayurveda or Herbal Treatment is safe during pregnancy as well dietary supplements, multivitamins or homeopathic & allophathic treatment may be continuing as per the wish of patient. We don’t recommend any kind of oral pills or smelling ointments or injections. 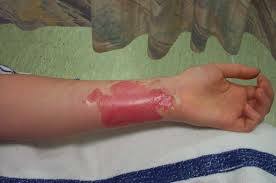 We use only herbal ointment / bandages (Burn care) for all kind of burn patients which is anti-inflammatory and soothing in nature. 4. 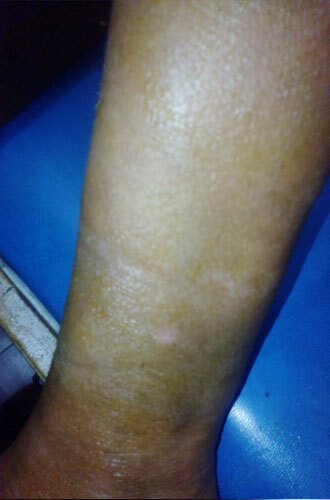 Usually patient confront with blood loss, hypothermia, keloids etc. 100% Natural & emphasis to stop flow of body fluids. 8. Low percentage of success Quite Good Results within few days, long lasting & instant results.